I've always admired the well-curated collages other bloggers put together, whether it's of an outfit or home goods, or whatever. I thought I'd try something similar, except I'd take a photo of items that I actually own on a white seamless. The problem is that I don't have a large enough white background, so this required some Photoshopping (just don't look too closely ;)). And don't mind how worn these jeans look... they are my go-to these days. I'm not exactly innovative when it comes to style, so don't expect anything revolutionary here — just an outfit I've been reaching for often this month! 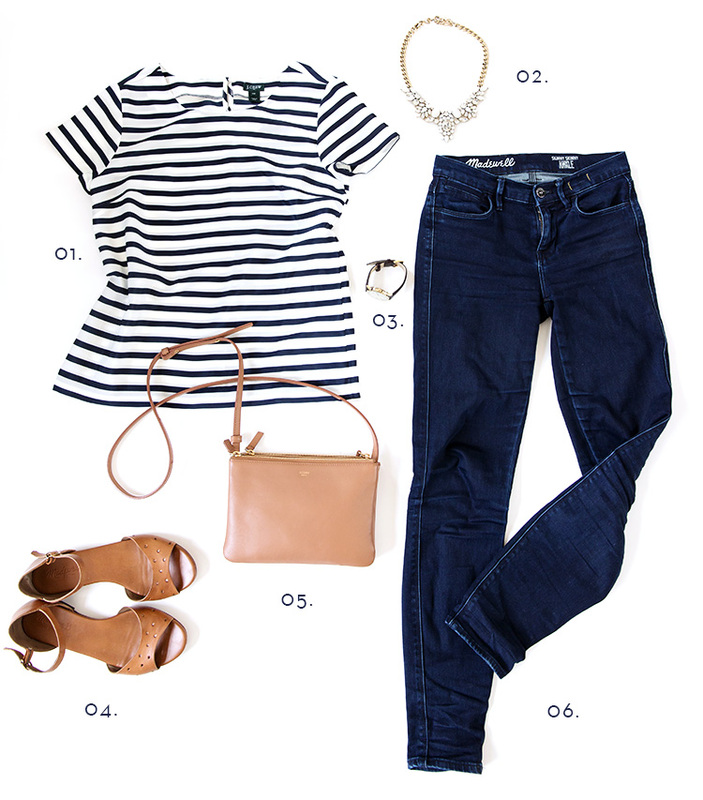 Stripes and jeans! Definitely my go to picks for casual outfits :) I like that you add a little glitter to your style. Beyond perfect in my books! I love the creativty of this collage- the outfit is simply chic and perfct! I would totally wear this outfit. It's chic, wearable and so practical. Innovative, perhaps not, but its so casual and sophisticated at the same time! I'd definitely shimmy into this outfit. This is absolutely chic and sophisticated. I love the easy Parisian sensibility. I've been reaching for my Madewell jeans often lately too. And i couldn't tell at all that you had to photoshop! The necklace is so pretty. I see that the hem is wrinkled. i wonder if you have the same problem i have with "ankle" length pants. they are almost always NOT ankle for me.